The ear canal (external acoustic meatus, external auditory meatus, EAM; Latin: meatus acusticus externus) is a pathway running from the outer ear to the middle ear. The adult human ear canal extends from the pinna to the eardrum and is about 2.5 centimetres (1 in) in length and 0.7 centimetres (0.3 in) in diameter. groove (cleft) of the first branchial arch. 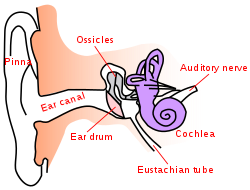 The human ear canal is divided into two parts. The elastic cartilage part forms the outer third of the canal; its anterior and lower wall are cartilaginous, whereas its superior and back wall are fibrous. The cartilage is the continuation of the cartilage framework of pinna. The cartilaginous portion of the ear canal contains small hairs and specialized sweat glands, called apocrine glands, which produce cerumen (ear wax). The bony part forms the inner two thirds. The bony part is much shorter in children and is only a ring (annulus tympanicus) in the newborn. The layer of epithelium encompassing the bony portion of the ear canal is much thinner and therefore, more sensitive in comparison to the cartilaginous portion. Size and shape of the canal vary among individuals. The canal is approximately 2.5 centimetres (1 in) long and 0.7 centimetres (0.28 in) in diameter. It has a sigmoid form and runs from behind and above downward and forward. On the cross-section, it is of oval shape. These are important factors to consider when fitting earplugs. Earwax, also known as cerumen, is a yellowish, waxy substance secreted in the ear canals. It plays an important role in the human ear canal, assisting in cleaning and lubrication, and also provides some protection from bacteria, fungi, and insects. Excess or impacted cerumen can press against the eardrum and/or occlude the external auditory canal and impair hearing, causing conductive hearing loss. If left untreated, cerumen impaction can also increase the risk of developing an infection within the ear canal. External and middle ear, opened from the front. Right side. Lateral head anatomy detail.Facial nerve dissection. ^ Faddis, B. T. (2008). "Structural and functional anatomy of the outer and middle ear". In W. Clark & K. Ohlemiller (Eds. ), Anatomy and physiology of hearing for audiologists (pp. 93–108). Thomson Delmar Learning.